Swimming is the best and wonderful exercise and is a well-known fact. It is an amazing combination of fun with exercise.There is a passion of swimming among people especially youth. We have brought certain skin care tips after swimming to have a safe and passionate swimming experience full of fun. A good swim not only makes you fit but keep you healthy and smart. It can tone your body and also release ‘happy’ hormones to keep you going for the day. Though it is a good exercise and everything, it still has some flip points and one major reason is its harmful effects on the skin. Now, how to save your skin from damage after a good swim. Chlorine in the water is highly harmful to your skin. Taking a shower with lukewarm water and some soap will help you get rid of the chlorine in your skin. Apply loads of moisturizer and lotion on your skin after a bath so that while your skin in damp, most of the cream will be absorbed. This will keep the dryness in check. It is also a good idea to apply a light waterproof sunscreen lotion before you take a dip. Drinking water is imperative when you are swimming. While doing this exercise, keeping your body hydrated is a very good idea. Also, a regular intake of fresh fruits and vegetables with vitamin C and A will give your skin that much-needed glow. Banana is known to be a good cleanser. Use a banana pack to reduce the dark spots around your face, neck, arms, and legs. Let the pack be till it dries up completely and then rinse and wash properly. 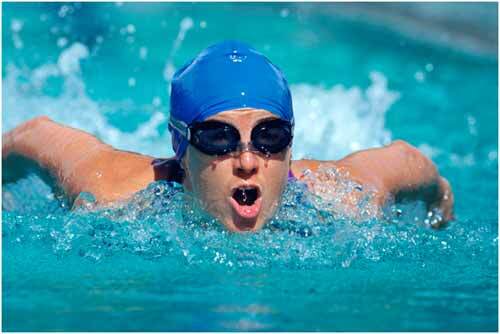 Swimming is indeed a wonderful exercise, but it can make your skin look dull and dark if not taken care of. So, next time before you jump into the pool, take a few minutes to follow these simple tips for a beautiful you!